Ridgeline is always a favorite trail! Dupont State Recreational Forest is a 10,400 acre state run forest just outside of Brevard, NC. It is home to close to 100 miles of trail and forest service roads. The number of trails is impressive, but with many of the trails being less than a mile in length, a map or a local guide is highly recommended. It is easy to spend a few days on the mountain bike in Dupont without re-riding any trails! However, some of our favorites like Ridgeline and Big Rock may tempt you into doing some extra laps. The riding is not very technical in nature (especially when compared with Pisgah), but it is amazingly fun! Fast and flowy is the name of the game. High speed bermed turns are all over the place. There are also a few trails that take you across giant slabs of East Coast slickrock! Like anywhere around here, you have to climb some to get to the fun stuff. Fortunately there isn’t much in the way of hike a bike, but you will certainly earn yourself a post ride beer from all the elevation gain (typically 100-125 ft/mile). The climbs are typically all less than 10 minutes long, so you never have to suffer too long. Dupont is a relatively young state forest with an interesting history. The original 7600 acres was acquired from the Dupont Corporation in 1996, with several additional tracts being added by the year 2000. The 2200 acre tract in the middle of the forest that contains many of the iconic waterfalls was purchased by the state when Governor Jim Hunt invoked his power of eminent domain. This action saved the area from a real estate developer who had plans to turn the land into a high end gated community. This action ensured access for everyone to come out and enjoy the unique and beautiful forest. There is a 476 acre section in the middle of the forest known as the “donut hole”. This was the actual site of the old Dupont manufacturing plant. Operations ceased there in 2002, and the infrastructure was removed by 2006. It will be several more years before the donut hole is open to the public. It is undergoing extensive environmental cleanup to ensure a safe environment for everyone to enjoy. 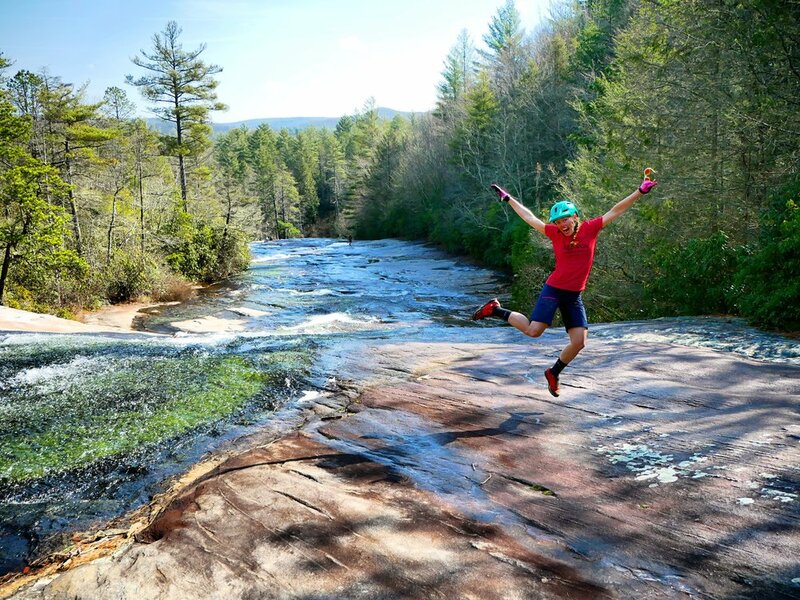 Dupont State Forest is an amazing place not only because of its natural beauty, but also because of the intricate network of trails that make for an amazing mountain bike destination. There are no fees to use the forest, but donations can be made at most of the parking areas. Trailheads have portable toilets, and the visitor center has a permanent bathroom. There are numerous trailheads that provide entry into the forest, and you really can’t go wrong with any of them. The lots are all gravel with plenty of room. The parking lots can get a little crowded during the summer time, but once you get out on the trails, crowds are not a problem at all! One of the benefits of over 100 miles of trail is that it spreads everyone out really well. There are numerous lakes in the forest that are great for swimming, stand up paddle boarding, or just soaking up the sun after a ride. Fawn Lake is the easiest to access and attracts the most people for sure. Lake Julia is amazing and worth the pedal (or hike). The forest hours are 5:00 AM to 10:00 PM year round. Bring a headlight and watch sunset from Big Rock and then cruise back down to the car. Or get there early in the summertime to beat the heat and the crowds. Dupont really has great mountain biking weather pretty much year round. The forest handles rain well and the trails dry quickly. This is important because it does rain a good bit. The fall and winter tend to be the driest seasons. Winter time is great with dry days and temperatures getting above freezing most of the time with only an occasional snow. Summer can have the typical sudden showers in the afternoon, but they rarely hang around for too long. Be prepared in the summer with plenty of water. It can be 85+ degrees, with no shortage of climbing, so you will sweat a lot! There is no water at most of the trailheads so come prepared. But with plenty of creeks and lakes, it’s not hard to find somewhere to cool off once you are done riding. Fall is an amazing time in the forest. The colors are simply stunning. The air is cooler and there is typically less rain, making for perfect conditions to get in some really long rides. It is probably my favorite time of year to be out in the woods. Ridgeline - This is by far the most popular trail in the forest, and for good reason! It is a fast flowy downhill trail that has endless rollers and berms that weave in and out of the trees. I honestly have never seen so many smiles at the bottom of any trail I’ve ridden. It is fun for all levels of riders, including kids. Just make sure to control your speed and don’t have too much fun. Like all the trails in the forest it is multi use and you will encounter hikers and people on horseback, so pay attention and yield accordingly. Big Rock - This is an aptly named trail… It’s basically riding down a giant rock! There are amazing views from the top and a fast, rowdy, and moderately technical downhill, what more could you want from a trail? The climb up is a bit steep, but totally worth it. Hickory Mountain Loop - This is a great loop ridden in either direction. The loop features steady climbing with some rocks and roots throughout, and then a fast downhill with a few turns that can sneak up on you, so pay attention! The trick is figuring out how to loop everything together to really get the most out of your ride (without excessive climbing, unless you are into that sort of thing). We can definitely help out to make sure everyone in your group has a fun time. There is essentially an infinite number of ways to connect all the trails in the forest together, so let us do the navigating for you! Often times when people talk about mountain biking in Brevard, they only mention Pisgah National Forest. But you will be missing out if you don’t make time for Dupont State Recreational Forest while in the area. It has some of the most fun, fast, and flowy trails you’ll find anywhere!! Everyone loves the feeling of going on a mountain bike vacation and finding amazing new trails that leave you grinning ear to ear! Part of the fun is just riding trails that are new and different. The same can be said for riding a demo bike! Riding a state of the art carbon wonder-bike just makes those new trails that much more fun!! Take advantage of riding a nice new demo bike to help make the most out of your vacation! 2. New technology is rad! Everything keeps getting better on mountain bikes each year. Suspension, brakes, shifting, etc. It just keeps getting better. 3. Confidence & Comfort. Your hard tail may be perfect for your trails at home, but a full suspension can definitely help smooth out the bumps on our rooty trails here in Brevard. The newer “plus” bikes with super wide tires can help to add even more confidence to your ride! 4. The right bike. Our local shops will help you to get on the right bike for the trails you want to ride! From proper suspension set up to tire selection, they know how to help you get the most out of your trip! 5. Find your new bike! Demoing different bikes is quite simply the best way to find your next mountain bike! You can read reviews all day, but until you spend some time in the saddle you’ll never know if it’s the bike for you. Jenna rode over a dozen bikes this past year before she landed on the perfect bike for her riding style! Have fun with it! 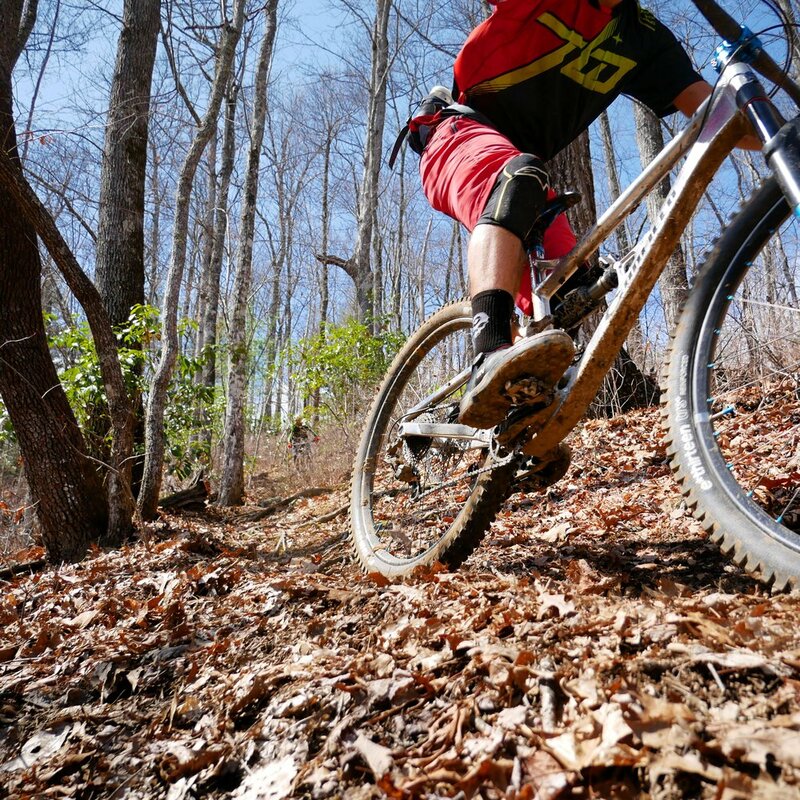 If you are planning a mountain bike vacation to Brevard, NC we would love to help you to have the most fun possible! The shops can get you get the most out of the bike, and we can help you get the most out of the trails! Don’t worry about hauling the bike you ride week in and week out all the way here, rent a fresh demo from a shop here in Brevard, and then let us show you around! No stress, just good times on the trails!! Check out Squatch Bike & Brews for some of the latest bikes from Intense & Ibis!! It’s winter. Officially. While short days and cool temps are definitely not my favorite, they are tolerable if you know how to prepare. Here are a few tips to help keep you on the bike all winter long, weather be damned! *Disclaimer* I know North Carolina winters are mild compared to a lot of places. This isn't for those of you who need fat bikes and electric warming grips and what not. Winter offers up some killer views! I love wool. It’s an amazing material. It keeps you warm even when it’s wet! And it doesn’t develop that funky smell like most synthetic materials. A good wool base-layer and some wool socks will help to knock the edge off the cold and help motivate you to get on the trail! Warm knees are happy knees. I am a fan of knee warmers and high wool socks, and Jenna likes full on insulated tights (“Fleece lined are the best!! They feel like kittens” - Actual quote from Jenna). Either one will work to help keep your legs toasty and warm (at least once you get riding). Layering is key to riding in cold weather. A nice base layer (wool jersey or regular short or long sleeve jersey works) and then a jacket over top is pretty simple and most of us already have most of that hanging in the closet. I like a thin shell over my long sleeve wool jersey. Jenna likes a breathable, short sleeve base layer, a long sleeve jersey over that, and then a softshell jacket that she can take off once she gets warm on the climbs. (Then she has the jacket to put back on for the descents.) Experiment and see what works best for you! Key point: Do not overdo it! You want to be mildly cold when you start! Because remember, you’ll start to warm up real fast on the bike! This may sound obvious, but thicker more insulated winter gloves are awesome. I recommend sticking with cycling specific gloves for the sake of dexterity and durability. I personally have three levels of gloves: summer, cold, and straight up freezing. I don’t use the “freezing” gloves often, but when I do I am glad I have them. If you have one, this is a great way to repurpose that helmet of yours that may or may not be sitting on the shelf collecting dust (like ours unfortunately do...must have that helmet for the 1-2 yearly ski trips!) It will keep your ears warm and your head nice and toasty. Bonus points if your helmet has vents you can open once you start warming up! If you do not have a winter-sport helmet, do not fret! A thin beanie/hat under your regular helmet will get the job done too! Extend your riding into the evening hours! Lights have gotten so much more affordable now that it is easy to get a good light for $100-150. Shoot for minimum 700 lumens. This will be enough to ride a lot of trails. I prefer my light mounted to my helmet so I can see where my eyes are looking. If you decide you like night riding then you can get an additional light to mount to your bars as well! Sometimes December can offer up some of the best riding conditions you'll find all year! This bluebird day on Black Mountain Trail in Pisgah was a perfect example! This is just a basic list of what it takes to get started in cold weather riding. Everyone has different cold tolerances, but the principles all still apply to pretty much everyone. Obviously more extreme environments require more extreme gear, but for most of us this basic list will get us out on the trails all winter long! Have fun, ride bikes (all year long)! I have a tendency to overly scrutinize a lot of my mountain bike gear. Maybe I read too many gear reviews, but I am always looking at stuff I use and trying to figure out how to make it better. I have a few things that have really impressed me recently that I would recommend to anyone. So here are a few things that I really like, December 2016 edition. It really looks pretty cool! Good job MRP! I have not run a chain guide in several years. My experiences with several guides in the past have always left something to be desired, and with modern clutch style rear derailleurs I have not seen the point of running one. Recently though, I had been occasionally dumping chains in some chunky sections of trail causing me to lose confidence in the rough stuff. Cranking hard and finding no resistance on the pedals can be disastrous, especially when you’re riding aggressively. I even had the chain drop and get wedged between my tire and chainstay a couple of times, not good for rubber or carbon! Anyways, after a fresh chain and cassette, I was still occasionally having issues so I ordered up an MRP 1x guide. It was a super quick and easy installation and I haven’t had to think about it since! Guides have definitely come a long way in the past few years. No rubbing on either end of the cassette, it’s super quiet, and best of all I haven’t had to worry a bit when I stand up and mash the pedals through the Pisgah chunder. Set it and forget it. Big thumbs up from me MRP! Tires are always a fun discussion to me. I am admittedly a bit of a Maxxis fanboy. So when they came out with the new Forekaster it caught my attention. Their description is that it is an “aggressive XC tire” that is “optimized for loose & wet conditions”. I happen to buy this tire during the recent drought, so my first few weeks on it were mostly fast rolling hardpack trails and it excelled even in those conditions. It has a bit of squirm at high speed on the super firm trails, but nothing disconcerting. I replaced a 2.4 Ardent with this tire and have been super pleased. It’s lighter, faster rolling, offers extremely predictable grip, and climbs great. It weighed in really close to the claimed 735 g (29x2.35). It is a skinny tire. I haven’t taken the calipers to it, but it doesn’t have the volume of a lot of 2.35s out there. I’ll do a full review after I get some more miles on the tire, but so far so good! Mud??? It's been a while!! After a lengthy drought complete with forest fires and tons of smoke, I never thought I’d be so happy to have rain. I have had to spend a few days just watching it rain out the window and let my bike sit in the garage. It even coaxed me into doing that suspension service that I’d been putting off for months now. But I’ll take it! Rainy days have never looked so good.